This past week’s Project We theme was food, sorry this post is a day late. During Spring Break I got to visit Universal Studios. There they have the new attraction “Wizarding World Of Harry Potter”. It was so cool because they had a replica of the joke shop and the candy store that you see in the movies. 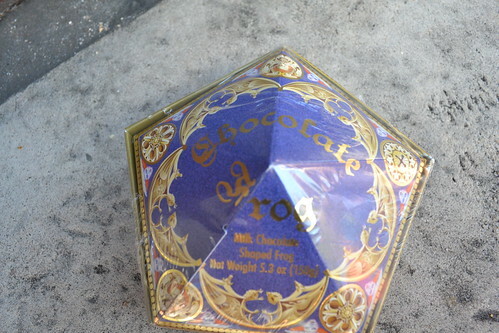 At the candy store I got a chocolate frog that Harry gets on the train in the first movie. It was really good and so sweet that I shared it with my brother and sister. The box of the frog looked exactly like the one in the movie just a little bigger. My mom shared my brother’s favorite special treat for her Project We post this week. He also got his treat at the Wizarding World of Harry Potter.